Arnesen was born in 1953 in Bærum, Norway on the outskirts of Oslo, where, at an early age, her parents immersed her in their passions: cross-country skiing and polar history. Her love of athletics and the outdoors eventually led Arnesen to compete in orienteering and cross-country skiing, as well as to coach high school students in advanced-level cross-country skiing. After her South Pole trek in 1994, Liv Arnesen founded her own company, "White Horizons," which provides motivational lectures and team-building programs to kids and adults. She is author of, Snille piker går ikke til Sydpolen (Nice Girls do not Ski to the South Pole) , which is about her 1994 expedition. She also recently authored a management book with Norwegian Jon Gangdal, Kan Jeg? fra drøm til virkelighet (Can I do it? From Dream to Reality). Beyond exploration, Arnesen has taught and coached high school and college students for more than 20 years and is involved in the rehabilitation of drug abusers. She holds degrees in Norwegian language and literature, history, sports and counseling. Arnesen spends many of her summer holidays in the Arctic at Svalbard (Spitsbergen) as a tour guide for Svalbard Polar Travel - a company for which she worked as marketing director prior to her 1994 South Pole expedition. Arnesen also enjoys hiking, kayaking, cycling and is an insatiable reader. Since the Bancroft Arnesen Expedition, Arnesen and Bancroft's inspirational story has helped shape , a 12-person, international motivation company that provides unique, authentic, personal stories of dreams in action, along with the critical knowledge and necessary tools to enable individuals and organizations to actively pursue their dreams and goals. The Bancroft Arnesen Expedition was the first in a series of adventures presented by yourexpedition under the Bancroft Arnesen Explore brand. Arnesen's expeditions have been featured by the BBC, CNN, CTV, National Public Radio, NBC Nightly News and NBC's Today Show. She also has been featured international print publications, such as People,USA Today, New York Times, Ladies Home Journal, Glamour, CurrentBiography Magazine, Outside, Sports Illustrated, Sports Illustrated for Women, O, the Oprah Magazine , and Time for Kids , as well as more than 50 international newspapers and magazines in Japan, Russia, Scandinavia, Germany, England, Australia, Italy and Chile. Arnesen currently lives in Oslo and is 49.
: Attempt with Ann Bancroft of an entire crossing or Arctic icepack, but due to unforseen circumstances and problems occuring between french TO and russian authorities, team has been forced to be evacuated on March 31st, 20 days after being dropped on the ice ! : Arnesen and American polar explorer Ann Bancroft become the first women in history to sail and ski across Antarctica's landmass Ãâ completing a 94-day, 1,717-mile (2,747 km) trek. 1996 : Arnesen climbs the north side of Mount Everest, getting to within 6,200 ft (1,900 m) of the summit before altitude sickness forces her to descend. 1994 : Arnesen makes international headlines by becoming the first woman in the world to ski solo and unsupported to the South Pole Ãâ a 50-day expedition of 745 miles (1,200 km). 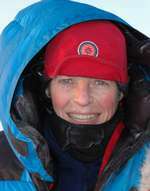 1992 : Arnesen leads the first unsupported women's crossing of the Greenland Ice Cap.